» home » enterprise zones » » is your press line out of control? Is Your Press Line Out of Control? to meet your ever-changing needs; but you also may be getting a controls nightmare. With each component addition, the controls equation on a press line gets a bit more complicated, unless controls were specified originally that could expand seamlessly with line additions. Of course, addressing controls expansion upon acquisition of a press doesn’t als occur, and the variety of line equipment added over the years may not be completely compatible with the existing control network. In these cases, a workable solution may be found inhouse that gets the line running. But productivity and efficiency may suffer. The press may run slower, faults may stop the line all too frequently and proper troubleshooting may be sacrificed. At some point on critical press lines—what press line isn’t critical?—control issues must be addressed, and a control cleanup is in order. That’s the message from Toledo Integrated Systems, Inc., Holland, OH, which provides controls and control-integration services to the metalforming industry. Company officials discussed with MetalForming the need for controls consistency across a press line and how that can be accomplished. To rectify such unfortunate situations, the next step involves assessing the current state of the line to determine a plan of action. The questionnaire also assesses incoming line voltage, press main motors, shut-height adjustment, the press-lubrication system and other line equipment such as hydraulic overloads, feeders, transfer systems, robots, etc., and addresses future planning, too. Cleaning up press-line controls and integrating ancillary equipment comprise a sizable portion of work for Toledo Integrated Systems. “The metalforming industry has moved more toward encompassing monitor and control functions into one system, which has been a tremendous growth segment for us,” offers Falcone. A controls cleanup can address press-line problems caused by the addition of equipment to the line over time without planning for consistent and adequate control of that equipment. A cleanup can ease troubleshooting (with a fault log and fault descriptions easily available via the control panel or remotely), leading to increased uptime, and ease line expansion the next time around. 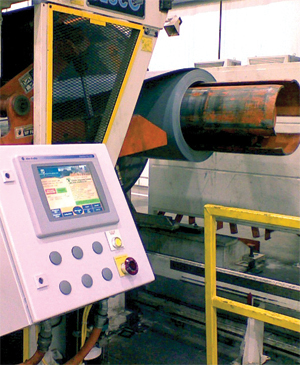 Toledo Integrated Systems project addressed line integration and control cleanup at an automotive Tier One stamper in Ohio, which over the years added a decoiling unit and feeder to a mechanical press. A controls upgrade can assist trouble-shooting by pinpointing the cause of press stoppage, according to Dave Buehler, Toledo Integrated’s controls manager. “This directs the operator or maintenance personnel to the problem, and a fault log, usually available in upgraded controls packages, can help in decision-making,” he says. Specifically on the Tier One project in Ohio, the existing uncoiler drive was faulting out multiple times per day. “Because control-communication problems hampered troubleshooting, the stamper did not know why the faults occurred, but would just reset and the line might run for another hour and then fault again and shut down,” says Shane Steinhardt, applications engineer. In addition, the line’s looping pit would periodically encounter a tight-loop condition, also affecting productivity. And, adding on to the older control system over the years with equipment from various vendors further strained line operation and troubleshooting. The cleanup included replacement of three human-machine interfaces with two units to simplify line oversight and incorporation of open-architecture communication to ease connectivity between line components and the overall control system. 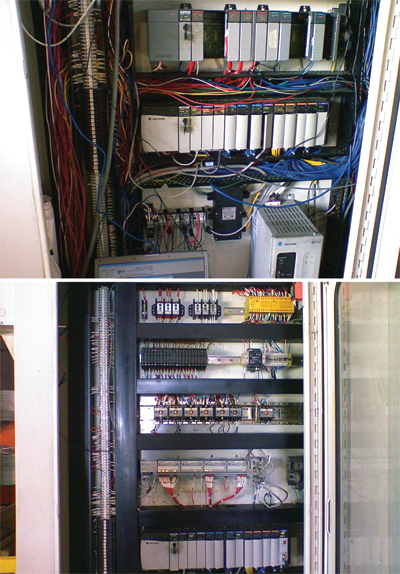 In addition, the stamper chose to replace existing older-technology DC drives and motors with new AC units. The installation of a shared DC bus between the uncoiler and the straightener axis helped share regenerative energy produced by the uncoiler during normal operation. The net result: less downtime leading to improved productivity, which illustrates the power of improved controls for cobbled-together press lines. Of course, stampers must decide if downtime is excessive to the point that it justifies the expense of a controls upgrade. When trying to justify that cost, remember that a controls upgrade also offers benefits should line expansion become necessary. The controls supplier and line integrator should assist the stamper in planning for future needs. That said, a control supplier can retrofit the right hardware on added equipment. “If the equipment is in good shape mechanically, you can make it work electrically,” says Buehler.